Some people worry... or blame others... or get angry. Others might use alcohol or drugs. These do not solve any problems. But prayer can help. Do you expect possessions to make you happy? My friend Fred had to have the newest and best. His credit card debt cost him two failed marriages. Having a lot of things doesn't guarantee happiness. But prayer and leading a good life does. Are you troubled by past mistakes? Is there guilt for what you did or failed to do... for broken relationships, for missed opportunities, for things done or words said that can't be changed. Never mind what might have been... you can't go back but you can still find peace. Prayer can help. You know you are hurting yourself, but you don't have the strength to quit. Prayer can help. Jesus wants you to be healed. He will help you to change.... if you ask Him. Say something like, "Jesus, please come into my heart and heal me.” Repeat these words and believe strongly that a partnership with Jesus will help you. God loves you. If He seems far away, please realize that being close to Jesus requires time and effort on your part. Prayer can help. You may be hurt and angry at the way others treat you, including family members, health care professionals and clergy. They don’t understand what it is like! 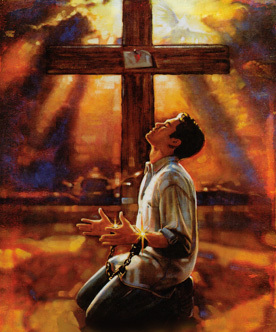 If you are depressed, hold a crucifix and study the man dying on the Cross. His love for you and other people is the reason He suffered. Will you pray... will you walk with Jesus?